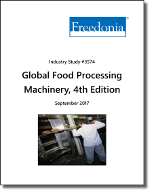 Global demand for food processing machinery will rise 5.9% per year through 2021. The most rapid gains will occur in the world’s developing areas; the Asia/Pacific region, Central and South America, and the Africa/Mideast region will all record sales growth above the global average, leaving only Eastern Europe below average. China, a critical market for many industry suppliers, will account for over one-third of global demand increases in value terms over the forecast period. Nearly all developed markets will post faster demand gains through 2021 compared to the 2011-2016 period, when sales were sluggish or declined.